The anti-immigration, anti-Islam, pro-gun, pro-conscription "Love Australia or Leave Party" has won registration from the Australian Electoral Commission, despite objections to the party's name and logo which were criticised for being racist, xenophobic or obscene. The party's logo is an outline of Australia with the word 'FULL' stamped through its centre. The group is headed by Kim Vuga, the grandmother who appeared on SBS's Go Back to Where You Came From reality television show. Her group supports a full moratorium on Muslim immigration and an end to all immigration until Australia's budget returns to surplus. "It is time the Australian people said enough is enough, and we want our country back," she writes on the party's website. Ms Vuga's party also calls for profiling of people with "anti-social(jihadist)" behaviour, Australia's withdrawal from the UN, the "right to bear arms" and revision of foreign ownership laws. It also supports the reintroduction of mandatory military service. The party has also supported US presidential candidate Donald Trump on its Facebook page as she criticised the New South Wales Parliament after it passed a motion condemning the politician. "GO TRUMP ... I hope he gets elected and crooked Hillary falls..."
"How many politicians in Australia are crooked? "Get on with the job and fix our country!" Adam Duncan objected to the registration of the party to the AEC. He wrote that the party's name was "racist and xenophobic and should not be allowed". "Also the logo submitted should be refused under 129A as it has been used on racist materials and is against the national interest to have a picture of Australia represented in such a way,"
Stuart Wardrop also objected to the party's registration on the grounds "this logo is obscene in its depiction of Australia". 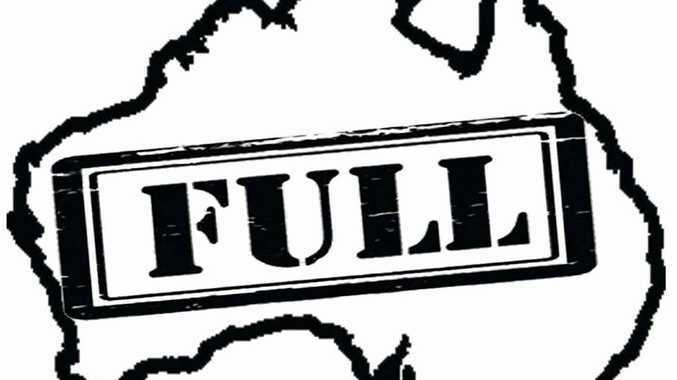 "Australia is not full, nor will it be full in the future," he wrote. In response Ms Vuga wrote that her party name was neither racist, nor xenophobic and that the word "full" imposed on Australia referred to the country being "full" economically. "The word 'FULL' represents that we are economicallyfull. Australia is struggling economically and is over $96m a day in debt," she wrote in response. "We need to secure our own future before we assist our global neighbours. "We have over one hundred thousand people sleeping on our streets and high rates of unemployment, we cannot turn our back on our own Australian citizens at the expense of others until we secure their future and those of all Australian Citizens." T-shirts with the slogan "If you don't love it, leave" caused a storm of controversy after Woolworths put them on sale for Australia Day in 2014. The supermarket removed the items from sale and described them as "totally unacceptable".